Jeans, maglia in cachmere e seta di Banjo&Matilda, biker boots, pochette che avete visto anche ieri e giacca fucsia, giusto per dare un tocco di vivacità! Vi auguro una buona giornata e a presto. Jeans, cashmere and silk jumper by Banjo & Matilda, biker boots, pochette, that you have seen yesterday and fuchsia jacket, just to give a vivacity touch! I hope you enjoy the result! I wish you a good day and see you soon. love your blazer, such a bright colour! LOve the pink blazer you look stunnig hun! that pink blazer really makes an extra statement! love your blazer and lipstick! very nice! and finally some good result ombre hair!! !Love, love, love! When you get the chance visit my blog again and tell me what you think of its new look! By the way, thanks for following. Thanks for stopping by my blog. FOllowing you now, follow back?? yea haha! I went ahead and clicked on all the buttons you had. Followed you through Twitter, Blogloving and Facebook :D! Hope you fo the same :D:D! I love the pink blazer! thank you for the sweet comment... i adore your blog too! great pop of pink! amazing outfit!the blazer is perfect! Love that blazer, such a wonderful comment! You are really gorgeous! Thank you for the lovely comment on my blog, I also adore your blog and would love to follow one another! Nice look. I love the necklace (key). I was sitting here trying to decide if I liked the outfit better with or without the blazer, but I really can't decide! They both look so good. I just bought a similar pink blazer! Love it! So adorable, I have a pink blazer also (though I love the color of yours better) and I love it! great casual outfit love the pop of color with the blazer! love the blazer and necklace! Lovely outfits! Love the hot pink blazer! So gorgeous!! Simple & chic. Great outfit! I love it and perfect pop of pink!! Con la giacca fucsia mi piace moooolto di più! So cute! Love how the blazer gives the outfit an entirely different look!!! You look adorable! 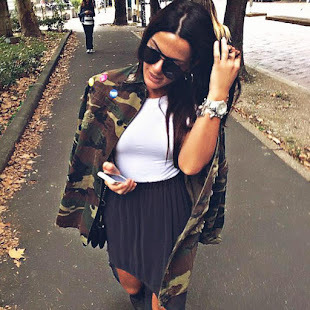 Great style and blog. i love the pop of color!! love the pink blazer !!! Pink looks great on you. I love how you did your hair.